I look to create dialogue between history and cultural iconography through the appropriations, and through the dialogue, contemporary meaning. I’m in the midst of producing a 5-painting series commenting on the PATRIOT Act. 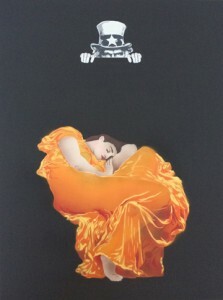 An appropriated female (in a vulnerable state) is the centerpiece of the first completed painting in the series. Flaming June, from Sir Frederic Leighton’s 1895 artwork of that name, is a figure sleeping in a near-fetal position, dressed in a semi-transparent gown. In my work, Uncle Sam peers over a wall at June. In case you’re not familiar with the PATRIOT Act, Section 215 (of 170 sections totaling 342 pages) enables vastly expanded government surveillance powers. The Act challenges our rights to privacy and due process, and in various ways I’m expressing my concerns through this series. I really like the transparency effect from Flaming June’s gown, and I’ve been playing with carrying that transparency on the figure through all of the paintings in this series. 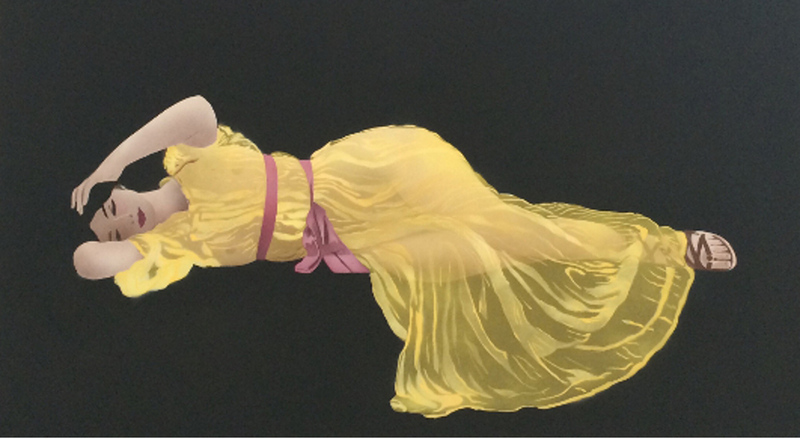 Last month I created “False Sense of Privacy” using a figure from John William Godward’s 1903 painting “Girl in Yellow Drapery”. The figure’s pose and the color palette of her dress hint at intimacy and I’m using her to make a statement about how it is in our most intimate moments that we are most vulnerable to invasions of privacy. Aspects of legal due process (obscured by the PATRIOT Act) are inspiring the piece I’m creating now, which I’m calling, “False Belief in Due Process”. I’m searching for the right art historical images to base the work on, and have been playing with options. I mostly use Google for my image research. I generally work in the evenings and on weekends after other responsibilities have been tended to, i.e., family time, to-do lists, and so on. I work in my house, finding the images, putting together and cutting stencils in one room and spray painting in my garage. I hope you’ll come to the upcoming Hothouse: imPRINT exhibit opening and let me know what you think of the work. Michael Fischerkeller was born in Pittsburgh, PA in 1961. He received his Ph.D. in Political Science from the Ohio State University in 1996. After purchasing a piece of street art in the Summer of 2014 he was inspired to create, to try and elucidate through art what have become increasingly complex political, social and economic issues. Fischerkeller has exhibited across the United States, including within exhibits that focus on art’s role in highlighting contemporary social issues. Locally his work has been shown at the Art League Gallery in Alexandria, VA, Touchstone Gallery and Hill Center Gallery in Washington, DC, Gateway Arts Center in Brentwood, MD and Washington ArtWorks Gallery in Rockville, MD. He lives and works in Upper Marlboro, MD. View his artist website here. This article was produced with the support of the DC Commission on the Arts and Humanities within a partnership between Day Eight and the Washington Project for the Arts. The “Hothouse: imPRINT” exhibit will be open from May 7 – June 20, 2015 at the Capitol Skyline Hotel. The image at the top of the post is a detail from the author’s artwork, “False Sense of Privacy (Patriot Act II).